Your latest product needs a registered design in Australia; there’s no doubt. You wouldn’t build a beautiful house and not put a lock on it or leave your $100,000 car out in the driveway with the doors open and the keys still in the ignition. It would help if you didn’t make a similar mistake with the products your company designs. Failing to obtain a patent: Just because you can’t see something (such as the idea or innovation behind your product design) doesn’t mean it doesn’t have value. The most common mistake with patents and trademarks is not obtaining these protections at all. Businesses sometimes only realise the impact of this mistake—and the full value of their ideas—once someone else copies those ideas. Only getting IP protection in one country: Yes, your business is based in Australia. No, that doesn’t mean you only need a design patent in Australia. The value of intellectual property is global, and something that is just trademarked or patented in one part of the world can be copied in another part of the world. Getting design protection that is truly global will pay dividends in the future. Not being specific enough: Every nuance of your product design matters in a patent application. The less specific you are about your product or invention, the less of it is protected under your patent or trademark. Teaming up with the right patent trademark agency will help you avoid these mistakes and other common errors. Look for a global company: As mentioned above, only getting a design patent in Australia is thinking too small. Look for an agency that does patent and IP work all around the world. Look for fixed fees: When you are talking about global trademark or patent strategies, things can get expensive quickly. You and your business may not have the resources to shoulder those expenses. Look for an agency that offers fixed fees so that you are aware of your financial footing from the outset. Establish an ongoing partnership: A good patent agency will stay your partner even after protecting your IP. You want someone you can call if you believe your patent or trademark is being violated, or if you have a new piece of IP that you want to protect. At ONE IP INTERNATIONAL, we offer all the above and more. We are a global IP protection company that provides fixed fees, stresses the importance of long-term relationships with our clients and does it all while extending streamlined, easy-to-understand services. To learn more, contact us today. 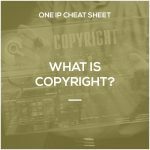 One IP Cheat Sheet – What is Copyright? 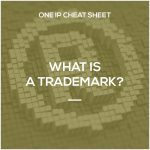 One IP Cheat Sheet: What is a Trade Mark?